When I taught 3rd grade in Canada, our public library had a wonderful video by the same name as the book below that I used to show my students before doing the following project. 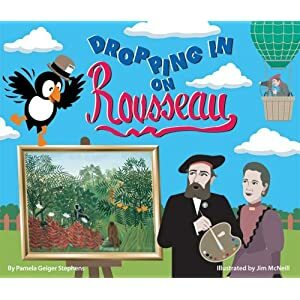 I had the book Dropping in on Rousseau available for students who wanted to read it during Sustained Silent Reading time. Reading a book and doing an art project is a simple way to start teach art appreciation to kids. After reading the book we looked at some of Rousseau’s jungle paintings and I explained about the repetition of the leaves and Bear pointed out that he mostly used green. We also noticed that amidst all that green there are usually a few spots of bright contrasting color to draw your eye into the painting. Bear started by drawing grass and plants, repeating the general shapes of these to recreate the Rousseau-ish style. We looked at an Ed Emberley book to figure out how to draw a monkey (great book for helping with drawing as he brings all the animals down to their most basic shapes). I had to explain to Bear how to only draw part of the lines so it looked like the monkey was behind the leaves. Then she retraced everything in black Sharpie. Then she painted – mostly green with some violet berries for contrast. This lesson works beautifully with students of all ages. I did this every year with my third graders, but I also taught the lesson to middle school students at a summer art camp. Here are two samples from 9th graders. Bear is so lucky – you are able to teach her step-by-step. Her painting is beautiful. I love her monkey! Your artist lessons are always neat to see. Since I used to be an art teacher (before stay-at-home mommyhood), I thought I'd seen them all, but I haven't seen this Rousseau book yet. It's great! The artwork inspired by it is beautiful, too. Thanks so much for sharing! I'm not sure the linky is working. Here is the link to waddleeahchaa.comhttp://waddleeahchaa.com/2011/03/21/not-a-stick-book-of-the-week-giveaway-and-free-printable-book/We've been doing a series on Drawing with Children. First we studied different artist much like you do and took a trip to a modern art museum. Now we are drawing our way through Mona Brooks' book Drawing with Children. I'm going to look for this book in our library. We've been reading about different artists and getting to know their art. This is one we haven't read. Thanks.